“This whole process is exhausting, sometimes I just give up, and I go home,” says a 28-year-old South African woman named Thandiswa. She’s talking about the process of looking for a job—in a township where unemployment is running north of 50 percent. Thandiswa is one of seven principal characters featured in After Freedom: The Rise of the Post-Apartheid Generation in Democratic South Africa, the latest book by Katherine Newman, dean of the Krieger School. 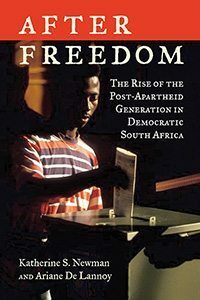 Co-authored with Ariane De Lannoy, lecturer at the University of Cape Town, the book is a penetrating and poignant exploration of race, prosperity, class, identity, and the shifting soil of hope, 20 years after the first free election and the inauguration of Nelson Mandela as the first black African president of Africa’s richest and most unequal country. Newman has been conducting field research in South Africa over a five-year period, joining fellow sociologist De Lannoy and a team of researchers to weave a work as multilayered as the fabric of South Africa itself, enfolding their characters’ disparate histories, their intersecting lives, and their newly shared destiny. It is Newman’s 12th book, reflecting, as do many of her earlier works, her abiding interest in families and individuals caught at the intersection of economic opportunity, race, and social class. Thandiswa is a Xhosa former cattle herder who, despite her new social equality, finds herself marooned in the sun-scorched outskirts of Cape Town, in a poverty-stricken township called Khayelitsha. There she lives in a house of “pale plaster, the color of milk” and is “mired in what seemed to be a paralyzing depression and without a job or any means of supporting her family,” the authors write. Yet just a few miles away, in a flat that “screams a kind of modernism” in a throbbing, multiracial seafront neighborhood, lives Amanda, “every inch the contemporary, upscale Black girl,” living a professional and social life that would have been unimaginable, and of course illegal, just two decades before. “Most distant observers look at South Africa only through the racial lens,” Newman says during an interview in her office at the Homewood campus. “But there are huge differences within the racial groups, differences that have widened since the end of apartheid.” It is a difference that registers Thandiswa’s inertia and Amanda’s ascent. South Africa in 2014, she says, is a land of “huge galloping inequalities—one of the most unequal countries on the planet. Trends that have emerged all over Western Europe and the U.S. slammed into South Africa just as apartheid ended. And the divide is widening. “Still, houses have been constructed. Electricity has been spread. Something much closer to universal education has been achieved. A pension system has been created. A child-allowance system has been created. Affirmative-action programs have been put in place.